Swept Away Classic Slot Guide & Review - Casino Answers! Swept Away is a 3-reel, 1-line classic slot machine developed by Vegas Tech. You can play the Swept Away video slot at US-friendly online casinos Crazy Slots Casino and English Harbour Casino. To play Swept Away, you can set your coin size at $0.10, $0.25, $0.50, $1, $5 or $10. You can also play 1, 2 or 3 coins by using the “Bet One” button. You can make a bet as low as a dime per spin on the Swept Away slot machine or you can bet as much as $30 on a single spin. To play the maximum bet and get the most value out of playing the Swept Away classic slot, press the “Bet Max” button. Otherwise, spin the reels using the “Spin” button. 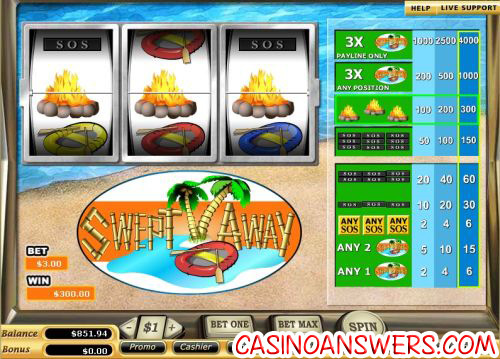 To win the 4000 coin top jackpot on the Swept Away slot, you must get 3 Swept Away symbols on the payline. If the symbols don’t hit the payline, you will only win 1000 coins (which is still a good win). There are 9 winning combinations on the Swept Away paytable. They include (1/2/3 coin payouts in parenthesis): any 1 Swept Away symbol (2/4/6), any 2 Swept Away symbols (5/10/15), any 3 SOS symbols (10/20/30), 3 Single SOS symbols (10/20/30), 3 Double SOS symbols (20/40/60), 3 Triple SOS symbols (50/100/150), 3 Bonfire symbols (100/200/300), 3 Swept Away symbols in any position (200/500/1000) and 3 Swept Away symbols on the payline (1000/2500/4000). You can get a $12,500 signup bonus on your first fifteen deposits to play the Swept Away classic slot machine and 100 other slot machines at Crazy Slots Casino! Are players from the United States able to play Swept Away for real money? Yes, players based in the United States of America are free to sign up, deposit and play the Swept Away slot machine for real money at Crazy Slots Casino and English Harbour Casino or any Vegas Techology online casino. Where can I play a Flash game of the Swept Away slot? To play a Flash version of the Swept Away Flash game, simply visit Crazy Slots Flash Casino and English Harbour Flash Casino and click on “Instant Play” to play their Flash casino for free or for real money. If you experience any issues playing the Swept Away Flash game, make sure you have the latest version of Adobe Flash Player installed on your computer. How do I win the top jackpot on the Swept Away slot game? If three Swept Away symbols appear on the payline at the same time, you will win the 4000X top jackpot on the Swept Away slot. However, if the symbols do not hit the center payline, you will win a lesser prize. Is there a slot machine casino game based on Lost? Cast Away slots? How do I get help if I’m stranded on a deserted island with no food or water and the island doesn’t have 3G?